American Football (just called football in the USA) is a team sport. It is played by two teams with 11 players on each side. 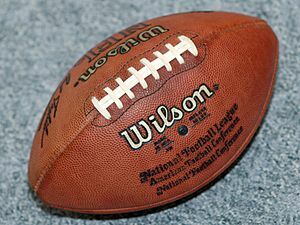 American football is played with a ball with more pointed ends. Points are scored in many ways, usually by one team getting the ball into the end zone of the other team. 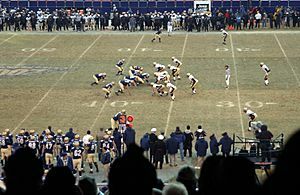 The main leagues that play American football (usually just referred to as "football" in America) are the professional National Football League, and the National Collegiate Athletic Association, which plays college football. In the National Football League, players are paid millions of dollars. In the National Collegiate Athletic Association, players simply play for the pride of their school, or for the chance to join a team to play for millions of dollars. Over a million boys (and a small number of girls) play high school football, also for school pride. There is also a closely related sport called Canadian football. A football game is played with a ball called a football. The sport is played on a grass (or artificial turf) field, exactly 360 feet (120 yards) long and 160 feet (53⅓ yards) wide. The end zones, one at each end of the field, are 10 yards long. The players wear protective equipment, including a helmet with facemask, shoulder pads, thigh pads, and often a mouth guard. A team has four chances, or "downs", to advance the ball 10 yards while the opposing team tries to stop it. Certain players advance the ball by carrying or throwing it. Teams can score by advancing the ball to the other team's end zone or by kicking the ball through a goalpost placed at the back of the end zone. American football is carefully regulated by time and rules, which are enforced by officials, who also determine when a team scores. A college or professional football game is 60 minutes long, and is divided into 15-minute quarters. In high schools, the quarters are 12 minutes long, and games for younger children are often shorter still. After the first two quarters, the teams rest for a few minutes during halftime. In NFL football, if the game is tied after the four quarters, the two teams compete in at least one more 15-minute period called overtime. During overtime, the first team to score points is usually the winner. However, under the current rules, first used for the 2011 postseason, if the team that has the ball first ends its possession by scoring a field goal, the other team gets a chance to score. If that team does not score, or if it scores a touchdown, the game ends. If it scores a field goal, the game continues, and the next team to score wins. During the regular season, only one overtime period is played—if neither team scores, or if both teams score field goals when they first have the ball, the game ends in a tie. During the playoffs, the game will continue with as many overtime periods as needed to decide a winner. If the game is tied after each team has had the ball once in overtime, the first team to score wins. American football is played on a field 120 yards long by 53⅓ yards wide. Most of the game is played on 100 yards in the middle. It is divided by 20 lines drawing every 5 yards. The field has two other sets of markings, running between the two end zones along the length of the field, known as "hashmarks". All plays must start between the hashmarks—if the last play ended outside the hashmarks, the ball is moved to the nearest hashmark. At the ends of the field there are scoring areas, called the end zones. Washington Redskins wide receiver Santana Moss catches a pass over two Atlanta Falcons defenders. Cornerback Brent Grimes of the Hamburg Sea Devils intercepts a pass. A player (dark jersey) scores a touchdown while a defender (in white) looks on. The goal line is marked by the small orange pylon. 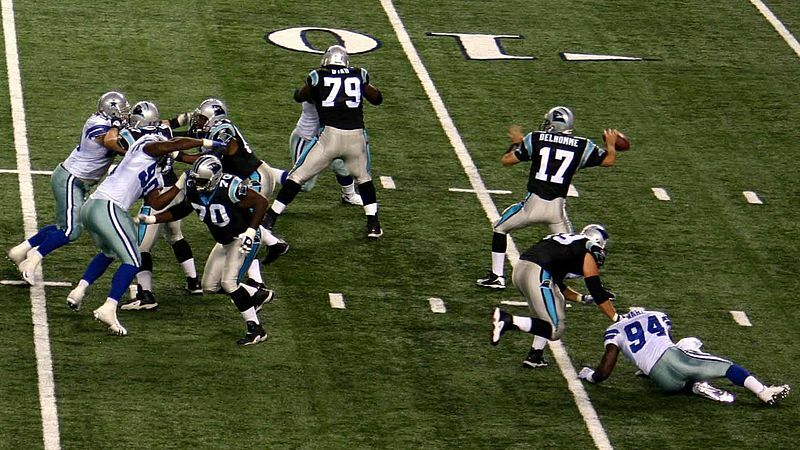 Carolina Panthers quarterback Jake Delhomme (number 17) in the motion of throwing a forward pass. Officials discuss a call on the field. Vince Agnew wearing a helmet. 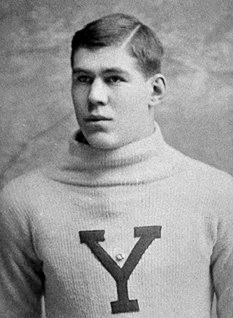 Shoulder pads and thigh pads are visible under his uniform. Players with one of the youth divisions of the Borregos Salvajes football program of the Monterrey Institute of Technology and Higher Education, Mexico City. Opening ceremony of the 2010 NFL International Series at London's Wembley Stadium. American football Facts for Kids. Kiddle Encyclopedia.